At the Seven Springs MOTHER EARTH NEWS FAIR, I used my table-top model to show people how to string-weave tomatoes. As the photo shows, I had #2 pencils as stakes and pieces of pink tinsel Christmas tree up-cycled as model tomato plants. I’ll bring the model to Kansas next. This is a good time of year to plan a new approach. String-weaving (also known as Florida string weaving and basket-weaving) is an easy way to support lots of tomato plants. If you have long rows, this method is ideal. All you have to store over the winter are the stakes. No bulky cages or heavy cattle panels or bulky rolls of wire mesh. This system also works for growing peppers and peas. We have used it for large determinates (Roma), heirloom tomatoes, and indeterminates. The ATTRA publication Organic Tomato Production includes a comparison of different tomato training and support systems. You can also see this on the extension page, Training Systems and Pruning in Organic Tomato Production. String-weaving comes equal-best or second best in almost all categories: earliness, fruit size, yield, quality, protection from sunburn and pest control. It is worst as far as labor cost, although the labor is spread out through the season, so it doesn’t seem so bad. 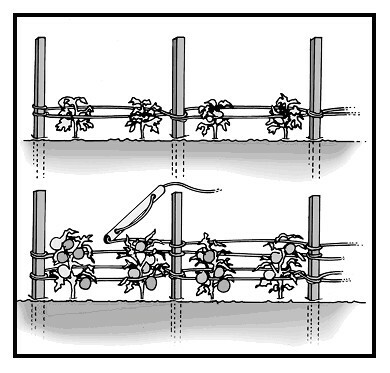 Trellising (a high wire between posts, and strings dropped down to wind each plant around) comes out best for earliness, fruit size and pest control (but worst for cracking, and thus not so good for marketable yield). Cages are best for marketable yield (so people who only grow relatively few plants could choose that method). But caged tomatoes do poorly on earliness and fruit size. The cheapest support system is no support at all – letting the plants sprawl on the ground. But the fruit quality and quantity is poor, (pests, rotting, cracking and sunburn reduce potential yields). Put tomato stakes in soon after planting, while the soil is still soft, and you can see where the drip tape is (and which side the roots are, if you planted in diagonal trenches). We use 6-foot (1.8 m) steel T-posts, with rows up to 150 feet (45.6 m) long without any extra bracing at the ends. Some people put an extra stake at an angle tied to the end stakes as a brace. Set one T-post after every two plants along the row. Our stringing tool made is a 2-foot (30 cm) length of wood, with a hole drilled through near each end. Twine is threaded through one hole and back out the other. A length of plastic pipe could also be used (pipe doesn’t need holes drilled through, as the twine can be threaded down through the pipe). The twine is not tied to the tool, but moves through it freely. The tool serves as an extension of the worker’s arm, to get the twine over tall stakes, and you can give it a quarter turn to pull the twine tight. (Pulling twine tight against your hand for several hours can cut through your skin.) For maximum efficiency, keep the tool in your hand all the time. Putting the bale of twine in a bucket makes it easy to carry and provides a space to store scissors and gloves. Stand between the working end of the twine and the slack being pulled out of the bucket - get yourself inside the loop when you start, to avoid tangles. That is, the spare twine will be running out behind you as you work the first side of the row. You’ll use it for the return journey. 1. When the plants are 12 inches (30cm) tall, tie the twine onto an end stake, about 8-10 inches (20-25 cm) above the ground. The tool functions as an extension of the worker’s arm, to get the twine over tall stakes, and also prevents “twine burns” to the hands. 2. Pass the twine in front of two plants and the next stake and wrap the twine around the back of the stake, pull it tight, and twist the tool to help tighten it. 3. Next, here’s our second trick: use the thumb or forefinger of your other (non-tool-holding) hand on the crossover to keep it tight, and loop the twine around the stake again, making sure that the second loop ends up below the first. This locks the twine so that if you let go, or later on a groundhog chews through your twine, the whole row doesn’t slacken. The second wrap of twine crosses the first one and locks it in place. 4. Continue along the row to the end, then take the tool round to the other side wrapping the twine round the end post. Coming back down the other side of the row, fasten the twine at the same level as the first side. 5. Weave back along the other side of the same row, putting a row of twine at the same level as on the first side. You will need to flip the twine that was behind you on the first side over to your new working side as you need it. Once you reach the end, tie off the twine and cut it. 6. You’ll see that you never actually wrap twine around a tomato plant, so there is never any injury from tight twine. The plants are simply held between two walls of twine that you “build” by making a new round once-a-week as the plants grow (every 8 inches (20 cm) up the stakes). Add a round of twine every week or every 8 inches (20 cm). You can measure using your hand. 7. At the end of the season, cut the twine each side of each post, and pull it out, then remove the stakes and till in the tomato plants. Laughing Stalk Farm in Missouri has posted a video of this method on YouTube. Pam Dawling manages the vegetable gardens at Twin Oaks Community in central Virginia. She often presents workshops at MOTHER EARTH NEWS FAIRS. Pam also writes for Growing for Market magazine. Her book, Sustainable Market Farming: Intensive Vegetable Production on a Few Acres, is available at Sustainable Market Farming, Pam's blog is on her website and also on Facebook.